This project was conceived by Chief Michael Jablonowski after the devastating 2017 wild fires. At that time, we had 8 firefighters led by Chief Will Horne. The fires devastated our service area with 95% of the land burned, 47 homes and countless outbuildings burned, and one death. The purpose of the project was to capture the Firefighter stories, share them with our community, and also to form a historical record to help inform future generations. We expanded the project to capture resident stories too. We recorded the stories as MP3 files and had them professionally transcribed. We then corrected the place and people names where transcription failed. We did not further edit the transcripts for grammar or readability… so you’ll read the dialog verbatim. We are not professional interviewers, so please bear this in mind as you listen to the recordings or read the transcripts. In many cases the interviewer had off-topic conversation as a preamble to the firefighter stories. If you don’t want to listen to that, forward ahead 10 minutes or so. Once the firefighters start to tell their stories… you’ll find the details to be incredible. 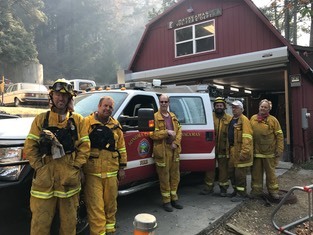 We wish we could have interviewed more of our residents, but we captured a representative sample of people who lost their homes, and those who did not; full time and part time residents; those who stayed to defend homes, and those who were evacuated; adult and youth stories - all are amazing.